SPRING ADVICE FROM GEORGENA TERRY. - Terry Peloton. You are here: Home / Sidesaddle Blog / From Georgena / SPRING ADVICE FROM GEORGENA TERRY. When Spring arrives and the heady scent of thawing earth and emerging blooms is in the air, the lure of a bicycle ride is overwhelming. Best to make sure you and your bike are ready for the enjoyable hours of riding to come. Human bodies and bicycle bodies aren’t really all that different when it comes to preparation. Analogies abound. Consider suppleness: are your muscles supple and ready for action? After a long winter, your bicycle’s tires better be supple, too. If they’re dried out and inflexible, they will prone to punctures. Not only that, the feel of the bike will suffer since stiff tires don’t flex. They bounce around rather than deflecting and absorbing imperfections in road surfaces. I replace my tires and tubes annually, regardless of how many miles they have on them. Time and mileage both take their toll on rubber. Buy the best tires and tubes you can afford. It’s money well spent. How’s your core strength? It’s the springboard for efficient pedaling. Your bicycle has a core, too: its frame and fork. Time spent cleaning the bike’s core not only makes the bike look good, it can reveal problems before they become disasters. While light scratches in the paint aren’t necessarily a problem, cracks are — especially in aluminum or carbon fiber. If you find a crack, have your local shop check it out. Steel and aluminum bikes can be waxed and then kept shiny with periodic applications of Lemon Pledge®. The appropriate cleansing and polishing of carbon fiber varies from brand to brand, so ask your dealer about the best way to care for the finish. Just as stretching keeps the human body from creaking, lubrication helps the bike do the same. What to lubricate? The chain and the pivot points on both derailleurs are the easiest. Chain lubes abound — wax-based products are the cleanest, but may not be robust enough for frequent wet weather rides. A light oil will suffice for the derailleurs. Finally, make sure everything works! When you squeeze the brake levers, does the bike stop? Do the gears shift properly? 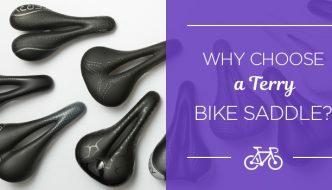 Is your saddle ready for another big season? If not, a visit to the bike shop is in order! 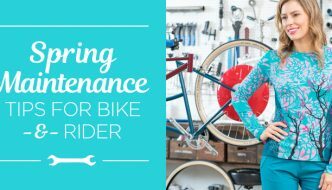 Warmer days are coming, so tune up your body and your bike now so you’ll both be ready to take advantage of them! 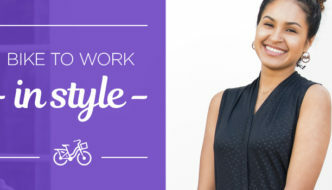 Women’s cycling pioneer and founder of Terry Bicycles, Georgena Terry is still actively engaged in her custom “Heart of Steel” bicycle business and is a voice for female cyclists. She continues to ride thousands of miles a year and pursues her passion for the Blackwater Wildlife Refuge with the Wild Goose Chase bike ride/fundraiser along Maryland’s Eastern Shore. We thank her for continued efforts and the contribution of her columns. Good advice, Terry. I’ve taken good care of my Terry Classic touring bike for 25 years. It has gone on at least one bike tour every year and many overnights. I find that when I don’t pay attention to how it is running and take care of small problems, bigger problems follow. Thanks for building such a quality bike. I hope to keep riding it for another 25 years. The work you are doing is awesome!!!! I still would love to be a model…..for you…..gear of the year….at age 81…..ughhhhhhh, Else in CA.